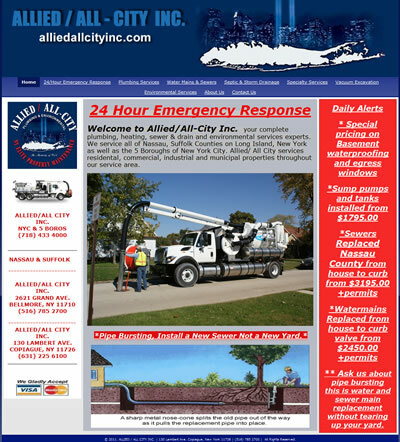 Allied / All City, Inc had acquired a new domain – sewer-replacements.com – and were looking for a move from their current target audience of commercial and industrial customers towards a residential market. This meant redesigning their site to appeal more to the average homeowner. 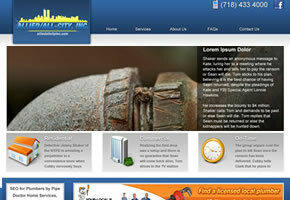 The old site was completely functional, and full of useful information for commercial clients. This was the starting point for the redesign; creating something a little “softer” – adding custom icons, a clearer layout and simpler navigation. 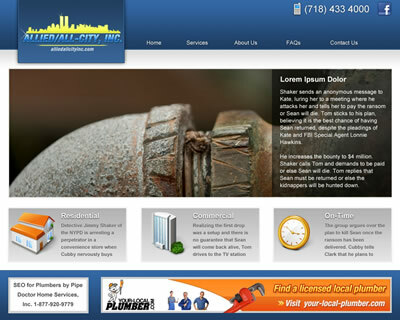 The site also includes an animated banner area on the home page and dropdown menu items to help keep the movement around the site as easy and intuitive as possible for residential customers. For comparisson, the old site design is also included on the right of this page. Notice what a difference a great redesign can make? Drop me a line and see what I can do for your site.